It’s okay if you’re in it just for the halftime show. It’s okay if you’re in it just for the commercials. When it comes to the Super Bowl, everyone has their reasons for showing up on game day. Make your Sunday Super Bowl festivities that much better by heading to one of these Portland hotspots. Aladdin Theater is hosting one of the biggest watch parties in all of Portland. Located at 3017 SE Milwaukie Avenue, this watch party event is absolutely free. Enjoy $4 drafts and pizza offering throughout the evening. Doors open at 2:30 pm. The Goodfoot Lounge is projecting the big game on a 14-foot HD Projection Screen, so really, what more can you ask for? There’s even exceptional food and drink options to make sure your tummy stays satisfied all evening long. The Goodfoot Lounge is located at SE 29th & Shark. Doors open at 3:00 pm. From hipster bars to swanky dance clubs, Portland seriously has it all. Looking to have a fun karaoke night? You’ll find it here. How about a delicious cocktail at a fancy hotspot? You’ll find that and so much more. Looks like it’s time to grab your pals for a night on the town. When you’re ready to hit the dance floor, then take your pals out to Holocene, a premier dance club unlike any other. With two levels, live bands, DJs, techno music, and more, you won’t find a better dance party in Portland. Ready for a night out like you’ve never experienced before? Dirty Night Club is ready to give you a night you won’t soon forget. Dance under floor-to-ceiling colored lights and sip on delicious drinks from a full bar. Some of the most sought after seats in all of Portland will be at Paley’s Place, a lovely little Victorian home that’s been converted into a restaurant. On New Year’s Eve, they’ll be serving an a la carte menu with yummy seasonal dishes. Make reservations. Every year, Portland’s South American restaurant throws one of the best New Year’s Eve parties in town. Serving up a four-course meal of Andean dishes, the total cost per person is only $75. Make reservations. There are plenty of amazing events in Portland, but if you’re looking for something fun and exciting to do this weekend, you’re going to love what EastBurn has in store for you. Get into the holiday spirit by heading over to the annual Ugly Sweater Party at this local Portland hotspot! When it comes to ugly sweaters, trust us, the uglier, the better! The EastBurn Ugly Sweater Party will take place December 17, 2016, at 10:00 pm and you can purchase your tickets, which are only $5, at the door. Make sure to leave the little ones at home with the babysitter as this is a 21 and up event. You’ll have the entire night to spend dancing around in an ugly sweater, hanging out with some really cool Portland folks, and enjoying delicious drinks and food at EastBurn. Featuring a lineup of musicians, you’ll even have the chance to dance the night away. When you live in Portland, you can be sure that there is always a lineup of fun things to do. Looking for the best holiday attractions this holiday season? Grab your pals and mark your calendars because here are a few places you definitely need to add to your list. One of the top-rated ballet companies in the region and the nation, the Oregon Ballet Theatre is the perfect location for getting into the spirit of the holidays. Head out to see holiday classics like Swan Lake and The Nutcracker. For ticket and venue information, go here. 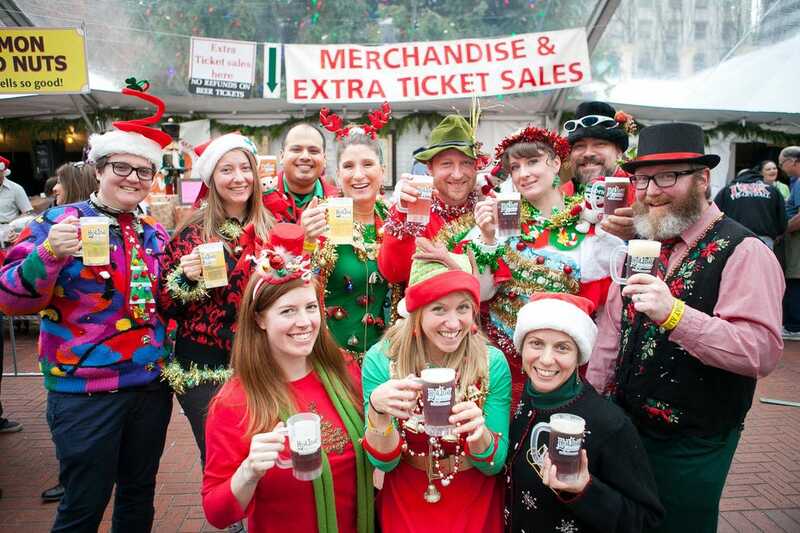 This is a Portland holiday tradition and it’s one you need to see to believe. This annual outdoor event will take place from December 2 through December 6 from 11:00 am to 10:00 pm. Dress warm as temperatures will most likely be on the chilly side.